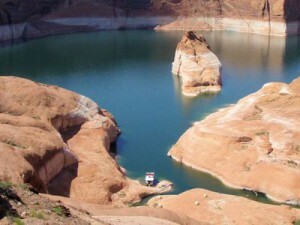 We get to lots of great places, but this Lake Powell trip ranks as a favorite, because we get to really inaccessible spots that can’t just be visited on a whim. This one is a logistical challenge that needs planning and organization to get right, plus a unique combination of licenses and permits to be able to take you to our favorite spots. As of 2012-13, we do not have a open-signup, this trip is available as a private/group trip, with a minimum of 6 to maximum of 12 people. Please contact us for possible dates and prices. Time of Year; this is a spring or fall trip, summers are too hot, and winter days are too short. Our preferred times are mid-April to end of May, and mid-September to the end of October. Weather considerations; the spring trips can have a mix of weather, from cool to hot, 60s to 90s (15 to 25 degrees cooler at night) would be a normal range. Because the days are longer, the sandstone can heat up more in the sun, so these are usually the warmer trips. But the water is still mountain snow runoff from the far-away Rockies, so the evening dip into the lake to refresh can be, depending on your attitude, either more refreshing after a long day in the sun, or too cool to consider. (We do have a back country hot shower solution available!) The fall trips, with shorter days, are usually cooler, with 50s to 80s as highs more common, and the nights correspondingly cooler, but the flip side is a warmer lake still nice to dip into after a long summer under the hot sun. Yes, it is a desert trip in spite of all the water underneath us, and yes, it can rain, although that is something rare. When it does happen, the instant waterfalls can be spectacular. And yes, it has snowed on us, once. Itineray This trip starts and ends at the airport in Salt Lake City, UT, although if you wish to drive, we can arrange to meet you at the Marina in Bullfrog, UT. Day 1, meet at the Salt Lake City airport at 10 am, travel by van south to Bullfrog. We will stop for lunch in Price UT, this is the one meal that is one your own. There is also a grocery store and liquor shop there, for any special food needs and for personal beverages. Note; we feed you well on the trip! So it is not necessary to stock up on any foods unless you have a secret addiction to something sweet. Once at the marina in Bullfrog, we transfer all of our gear to the houseboat, where your guides will prepare the first evening’s meal as the sun sets over the layered sandstone hills to the west. We spend the night on the boats at the dock. Day 2, after you get your first cup of coffee – or tea – we leave the dock early with breakfast prepared after we get underway. It is roughly a 4 hour trip in the houseboat to the mouth of the Escalante, between beautiful, steep, colorful sandstone walls that are the edges of the Glen Canyon. 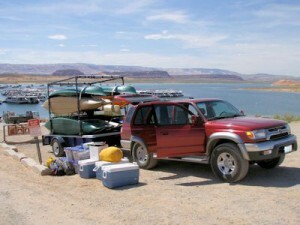 After turning up the Escalante, it is typically 1 to 2 hours to find a campsite, set up tents, and offload all of our gear before we can get in the kayaks for a 1 to 3 hour exploratory paddle into a nearby canyon. Then its time for a dip in the lake before dinner is served on the upper deck, followed by star-gazing in a night sky unaffected by any light pollution. Days 3, 4 and 5 are weather-dependent, your guides make the schedule after arrival for the week based on the campsite and the weather forecast, but it will usually include two days of paddling/hiking totaling about 6 to 7 hours, and one full hiking day, about 5 to 8 miles in desert conditions. On the paddle days, we will travel in our kayaks up side canyons until we run out of water deep enough to keep us afloat, where we will pull the boats out and hike up the creek or stream to lunch spots that we know, places where you just might want to spend a week on your own someday. The hiking day is usually to a desert world almost free of any recent human use, although you will find the tracks of many other visitors. And of course, featuring our favorite lunch spots. Upon return to our camp each day, there is the lake calling to you in hot weather, and our wonderful dinner surprises awaiting you on our upper deck. Then there is the evening fire, and of course the night sky. Day 6 is pack-up day, store all the gear back on the houseboat, for the ride back to Bullfrog. But unlike our journey out, we now have a full day to perhaps take a few side trips up some of the canyons we passed on the way in, for a short hike or two, or just floating past other sights that might include some Anasazi ruins high in the cliffs overhead. That evening, back at the Marina we unload our home for the past week, and head over to a nearby lodge – which has wireless for the connection-deprived among us – for softer beds, non-stop showers, and a group dinner in the restaurant at the lodge. Day 7, after an early breakfast at the restaurant, we saddle up, get all the gear packed once again on the van, and begin the drive back to the Salt Lake City airport and the nearby hotels. But like the more leisurely houseboat trip the day before, we may have time for a side trip or two, to visit some of the other unique spots hidden in this land of stone and sand, that will include a picnic lunch. Arrival at Salt Lake City is typically around 5 to 6 pm, so if you choose to fly out that evening, you should not schedule your flight for any earlier than 7.30 to 8 pm. We say goodby to you at the airport or your hotel, and for the first time in a week you will be on your own for food. A note on gear in the modern world; these canyons are deep, and are far from anywhere. While cell phone and data services are available at Bullfrog, do not expect to be able to connect from the lake or our campsite. If you absolutely, positively need to be connected on a daily basis, consider renting a satellite phone. Emergency communications are available to us, through the Marine radio system on the lake. Our houseboat is equipped with the necessary radio, and our guides each carry hand-held radios. Your GPS will usually work, although you may lose the connection in some narrow canyons.